HOW DO YOU GO ABOUT CHOOSING CLASPS? 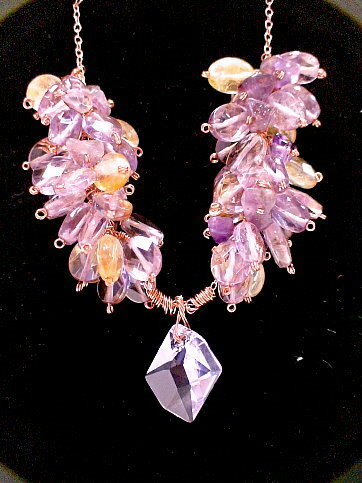 The Jewelry Designer makes many choices when creating a piece of jewelry. Lots of things to manage and accomplish. When you work with so many customers in a store, and so many students in classes, you begin to see that people are not necessarily that great in selecting clasps. Many are in a clasps-rut — they use the same clasp over and over again. Others pick out clasps they find appealing, whether or not they would visually or functionally work with the piece they have made. Few people anticipate how they are going to attach the clasp to their beadwork, often resulting in an overly long, awkwardly connected clasp assembly. So, how to you go about choosing clasps? Clasps always seem like they’ve been someone’s last thought. They should be the first thought. But many people get so excited creating their beadwork, that they forget about the clasp – until the last moment. You can tell when the jewelry maker hasn’t put much thought into their choice of clasp in many ways. Often, the clasp doesn’t look like it was meant to go with the bead work or general design. It might be out of proportion. It might be a different texture or sensibility. Its function – how you open and close it, while wearing your jewelry — might seem odd, perhaps unnatural. And not only does the choice of clasp seem as an after-thought, but how to attach to the bead work to that clasp seems un-thought out, as well. So it’s not surprising, that when we were repairing jewelry on a regular basis, about 80% of the pieces to be fixed had broken at the clasp. It is best to, in part, build your design around your clasp. If your piece has a centerpiece or focal point, then how does this link up to or coordinate with the clasp. 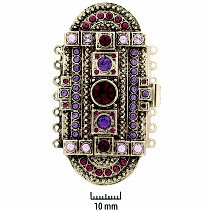 At the least, when visualizing your beadwork, include an image of the clasp and how it is attached at both ends. The world is full of clasps. Not every clasp is a jeweler’s best friend. But it depends. The clasp needs to visually fit with the beadwork. It needs to function as the artist intended. It needs to function in a way the wearer can relate to, use and handle. It needs to be appropriate for the piece and the context in which it is too be worn. It should not compete with the beadwork. It should complement it. Ideally, at least from a design perspective, your clasp should look and feel as if it were an integral part of the entire piece. In a Gallery setting, if you are selling your jewelry there, you usually want a very functional, but not overwhelming, clasp. You are selling your beadwork, and you don’t want your clasp to compete with this. In a Department Store, setting, however, often the clasp sells the piece. In this setting, choosing a clasp requires a different kind of logic, thinking and anticipation. Some clasp-types are “expected” to be a part of the piece – even if the particular choice of type would not be the best choice in the world. The former owner of a local Tennessee pearl company was very frustrated with clasps. She sold a lot of finished pearl jewelry at very high prices, and had been using 14KT gold pearl and safety clasps. Her customers sent a lot of their pearl necklaces and bracelets back for repairs, because their clasps broke. And this company felt, because the prices of these pieces were very high, that they were obligated to replace the clasps and re-string these pearl-knotted pieces at no additional charge. 14KT clasps – particularly the pearl, safety and filigree box clasps — do not hold up well, because gold is a very soft metal. Replacing clasps on a pearl-knotted piece is quite some job. You have to cut up the piece to free up each bead, and then you begin the knotting and finishing off processes again. It turns out, the 14KT clasps were not the only expensive part of the bracelets – making the knots between each pearl was the time-consuming and costly part. She desperately wanted to reduce the number of repairs. 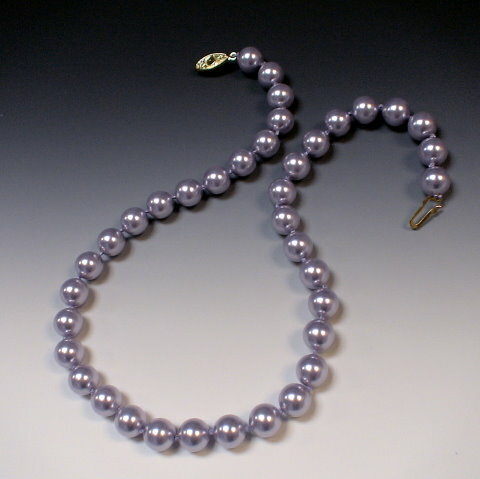 Her first idea was to replace the pearl and safety clasps with other styles which were sturdier. However, these pieces didn’t sell. People wanted the pearl and filigree clasps. The designs of these clasps were so traditional and so locked into their expectations for what pearl-knotted jewelry should look like, that they would not compromise. Her second effort, she tried replacing the 14KT pearl and filigree clasps with gold-filled ones which were stronger, but this made her customers very angry – they wanted 14KT gold. So, her final strategy, she returned to using 14KT gold, and doubled her prices. She built in the cost of one repair into the prices she charged. And only then could she present her happy face to her customers, and her somewhat-happy face to herself when she was in private. — Spiral, Cross, Triangle, Round or Square? Diane Fitzgerald had pointed this out as an interesting book about shapes, I think in her book SHAPED BEADWORK. I read the book. Fascinating and goes into a lot of interesting detail. In this book, the author, who is a cultural anthropologist, studied shapes, and searched for universals. She found that cross-culturally, people use 5 particular shapes to describe and understand themselves in relationship to others within their culture. She developed what she calls the Preferential Shapes Test. Take this test, and use Arrien’s book to interpret the results. I’m going to oversimplify this test and paraphrase her words, so you can try it, if you haven’t already. However, to read more details about interpretations and to read stories about people who fit various patterns, I’d suggest you visit this book. On a piece of paper, write the numbers 1 thru 5 across the page. SPIRAL, CROSS, TRIANGLE, ROUND, or SQUARE. Under the first position number, put your favorite shape. Under the 2nd position number, put your second favorite shape. Under the 5th position, your least favorite. This is where you think you are today or want to go in the future, but not necessarily the most accurate indicator of where you actually are right now. An inherent strength predominant in you at this time, whether you know it or not. Often, this is how other people see you. This is the most significant shape. This shape shows your true current self. Think of the goldilocks story – the porridge is too hot, the next too cold, the third just right. This shape points to past events or things which motivated or provoked you to get to Position 3. A process you have outgrown, dislike, resist, or are judging. Unresolved issues you want to put aside. HOW DO YOU PLAY WITH SHAPES? SHAPES — HOW DO YOU PLAY WITH SHAPES? How has “shape” entered into your design thinking, your design work, and your design frameworks? Over the past few months, I’ve been intrigued with all the new shapes of seed beads coming out on the market. I’ve been trying, really struggling, with ideas for using them in compositions — pieces that have a lot of dimensionality to them, great interest, some levels of complexity. And I’ve been trying to mix the shapes within the same composition, things like long magatamas, superduos, mini fringe drops, peanuts, tila beads. 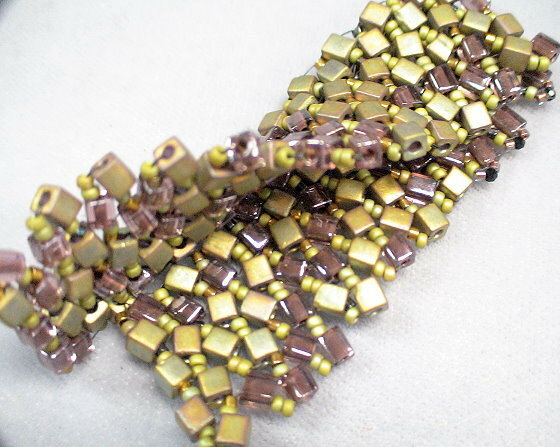 … And of course, it’s always fun to think about ways to bead-weave beads into larger shapes. The shape of the bead and the orientation of its hole or holes is critical to the success of a piece. These are the “building blocks”. Connecting the blocks affects what the piece looks like, how light and shadow impact the aesthetic, how it moves, how it drapes and feels, and how it holds up in its entirety as a composition. 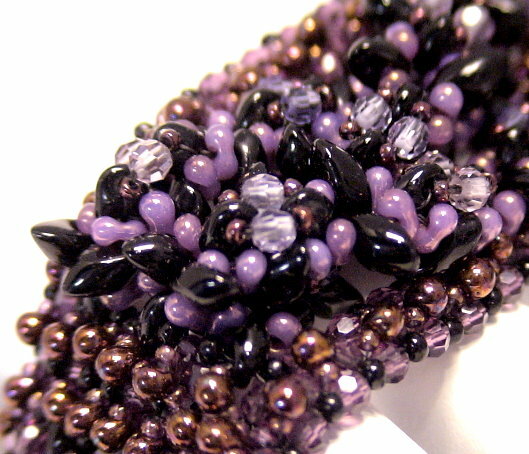 Around 2010, the various bead companies in Japan and The Czech Republic began introducing many new shapes of seed beads. I began experimenting with how to push these new shapes to their limits. Then there are the shapes created by assembling beads into ever greater shapes. Shape differs from the use of “line” or the use of “point”. Shapes serve to provide positioning, direction and orientation to the pieces, often better than lines and points. Shapes are often the basis of many strategies for adding more dimensionality to your pieces. And you can embellish these shapes with other beads, or overlap shapes, to achieve even greater dimensional effects. You can combine different kinds of shapes. How do we position each bead? How do we link them? How do we stack them or layer them? When visual impact does each have, given which side or “face” is seen? How do we use shape to create appealing textures and patterns? How do we create “forms” and “themes” with them. Playing with shapes can be both an encumbrance, as well as an opportunity for the designer. How has the playing with shapes affected your work? 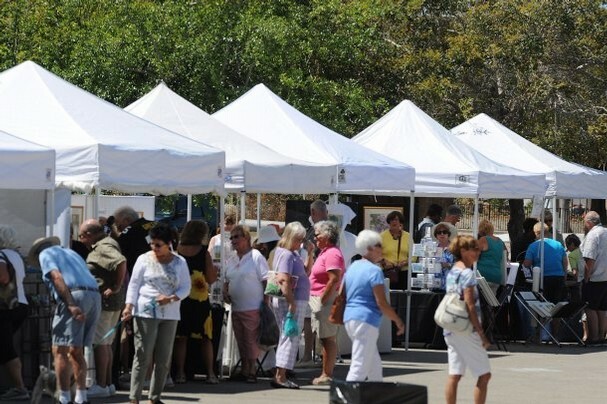 In this class, presented in 6 parts with 16 lessons, artist and businessman, Warren Feld, will fill you in on the ins and outs, the dos and the don’ts of selling at craft shows and fairs. Which are best for you, which may be a waste of your time. How to compute the revenue you must earn to justify participating in an event. This is a must see class for anyone thinking of entering the art and craft show world and will maximize your chances of success in these venues. 6 Broadcasts. TO WHAT DEGREE DOES/SHOULD “FASHION” INFLUENCE OUR JEWELRY DESIGN DECISIONS? In our store, I am asked repeatedly about what the current fashion colors are? Did I see what so-and-so was wearing on TV or at an awards show? But usually, at least in Nashville, TN, a sense of fashion plays a small part in the day-to-day decisions most people make about the jewelry they want to wear. What are your feelings and views? What are your experiences? What role should “Fashion” play? How important is Fashion to jewelry design? Should we take our design “cues” from New York and Los Angeles? To what extent do you think Fashion influences the average woman’s choices she makes, when purchasing or wearing a piece of jewelry? From an article I wrote… APPLIED FASHION Women don’t just wear pieces of jewelry – they inhabit them. Buying a piece of jewelry for yourself – a necklace, a bracelet, earrings, a brooch, something else – isn’t a task easily given to someone else. It’s often not a spur of the moment thing either. You just don’t rush off to the local boutique or the local Wal-Mart, grab whatever you see, and go home. I’m not talking about that impulse buy during your leisurely visit to the mall. I’m referring to purchasing those pieces of jewelry you know will have to do a lot of the hard work to accessorize your wardrobe and help you get the compliments and notice of your family, friends and co-workers you comport with and compete with each and every day. The jewelry you buy has to conform to quite a long list of essential criteria before you could ever think of buying it. It is something you will wear more than once. As such, it is your companion. Your necklace is not merely lying around your neck. Or your bracelet around your wrist. Or your earrings dangling from your ears. Jewelry can cause you to lose face with others. It can irritate or scratch your skin, or get caught up in your hair. It might weigh you down or stretch or tear your ear lobes. Jewelry can break without warning in the most unexpected and embarrassing of places. It can get caught on things, sometimes hurting you in the process. Jewelry conveys to the world something about who you really are, or think you are. As such, jewelry is very personal. Your private, innermost, most soul searching choices made very public for all to see. As you caress it, as you touch the smooth or faceted or crevice’d beads and metal parts or the clasp or the material the beads are strung on, when you twist and move the piece within your hand, you are confirming to yourself the extent to which your jewelry is doing its job. When you buy new jewelry, the dilemmas multiply. How will the new compare to the old? Will it be able to handle all these responsibilities – looking good, representing you, fitting in with your wardrobe, meeting the expectations of others? Like divorcing, then remarrying, changing your jewelry can take some time for readjustment. And you do not want to be seen as noncommittal to your jewelry. This would sort of be like going to a hotel, but not unpacking your suitcase while staying in the room. Conveying some sort of social or psychological distance from your jewelry can be very unsettling for others. So you need to inhabit it. You need to inhabit your jewelry, wear it with conviction, pride and satisfaction. Be one with it. Inhabiting jewelry often comes with a price. There becomes so much pressure to buy the “right” pieces, given all the roles we demand our jewelry to play, that we too often stick with the same brands, the same colors, the same styles, the same silhouettes. We get stuck in this rut and are afraid to step out of it. Or we wear too many pieces of jewelry. The long earrings, plus the cuff bracelets on both arms, plus the head band, plus the hair ornament, plus the 7-strand necklace, plus the 5 rings. We are ever uncertain which piece or pieces will succeed at what, so hopefully, at least some combination or subset of what we wear will work out. And our need to inhabit our jewelry comes with one more price. We are too willing to overpay for poorly made pieces in our desperation to have that right look. The $100.00 of beads strung on elastic string. The poorly dyed stones which fade in the light. The poorly crimped and overly stiff pieces with little ease for accommodating movement and frequent wear. It is OK to inhabit our jewelry. In fact, it is necessary, given all we want jewelry to do for us. But we need to be smart about it. We need to learn to recognize better designs and better designers.